As it’s one of my top 5, I really ought to have a thorough, thoughtful review of this movie. But I’ve been sitting here at my computer, trying to find the words that encapsulate everything about this movie, and everything I feel about it (and also feeling like a schmuck for falling back on that old cliché, writing about not being able to write). Like Mabel and Nick, I’m having a communication problem. I don’t know how to express my love. But I’m just going to spill it out, and whatever happens, happens. I’m going to improvise. No performance moves me like Gena Rowland’s shattering portrayal of Mabel Longhetti. She works wonders with an incredibly nuanced, complex performance, making every gesture and look and verbal stutter pack a punch. Mabel wants desperately to please. She’s willing to be whatever Nick wants her to be. She also knows that she should just be herself, and that battle inside her has frazzled her nerves. She’s out of touch with polite social graces, unaware (and paradoxically, all too aware) that her eccentricity makes others feel awkward. Sometimes she doesn’t communicate properly… and sometimes no one listens properly. “Will you stand up for me?” is one of the most heartbreaking lines I know of. None of her “crazy” behavior is actually harmful… it’s just inappropriate. It looks funny. Adults aren’t supposed to act like that. They’re supposed to have “conversation, normal conversation”. The weather. How are you? Whatcha been doing? At least, that’s what Nick thinks. Nick is just as fucked up as Mabel, if not more so… it’s just that his craziness looks more socially acceptable. He loves Mabel. He clearly, sincerely loves Mabel and her kookiness. But he feels a need to control every situation, especially when others are looking on. Anything awkward that Mabel does is made ten times worse by Nick’s reaction to it. The “influence” that the woman is under is not drugs or alcohol (although we see that when Mabel drinks, she does it irresponsibly). The influence is Nick. Nick wants one thing (the “real” Mabel) when they’re alone and another thing (the “normal” wife he can beam proudly about) when others are around. Nick’s embarrassment over Mabel makes him lash out and try to control her… and if he can’t control her with stern looks and scolding condemnation, then he resorts to violence. It’s one of the miracles of this film — and Peter Falk’s performance, which is also brilliant — that he can strike Mabel and you can understand it. Let me be perfectly clear: understand it, not condone it or accept it or forgive it. Nick isn’t a hero. If you see Nick as the long-suffering husband who rightfully smacks his wife to keep her under control, then you’re reading it wrong or you have your own issues to deal with. But you can understand how a person with Nick’s overwhelming need to control everyone around him (even dictating how his children will enjoy themselves at the beach) would snap. And you can understand how a person so desperate to be loved and accepted would forgive him. He’s a human being, she’s a human being. They love each other. This entry was posted on October 18, 2014 at 7:27 pm	and is filed under Movie Reviews. You can follow any responses to this entry through the RSS 2.0 feed. You can leave a response, or trackback from your own site. Great review Martin, one of your best I think. 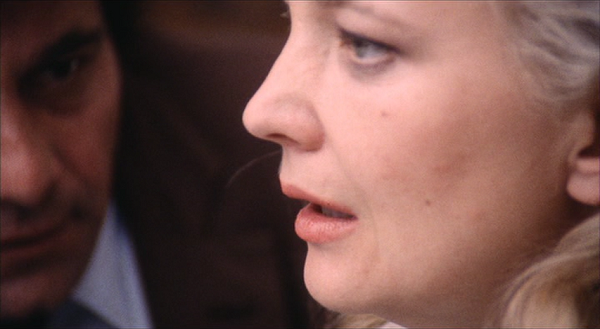 This movie is really unlike any other and Gena Rowlands gives a performance that clearly deserves to be included among the very greatest film performances in history. No one is more deserving of an honorary Oscar. I’m not sure I’ve ever watched another movie with such raw emotion (and if I have it’s probably another Cassavetes movie). Thanks, Evan! Rowlands’s performance here is my absolute all-time favorite.